Independence day has arrived! Atlantians rejoice because Freedom Park is opened again! Monsters have swarmed Freedom Park and they’re stomping all over your freedom! It’s time to bring down the hammer of justice and show your enemies what it means to be independent in this level 80+ Event Dungeon. As you fight, you’ll gain Freedom Flyers, which can be traded for some awesome items. To enter Freedom Park, you must have a Freedom Park Ticket. Once a day, during the event period, if you accumulate an hour of log in time daily, 1 Freedom Park Ticket (1 Hour/No Trade) will be given. To get more tickets, you can exchange flyers with Merchant Acong. Inside there are monsters that waiting to be destroyed with the mighty fist of freedom! Each monster has a chance of getting Freedom Flyers. To easily get more Freedom Flyers, help Luna with her requests to defeat Freedom Park monsters. These quests can be done daily. Once you have accumulated enough flyers, you can exchange them with the merchant Acong located inside Rome. As you have obtained the exclusive mounts and decoration you can upgrade them into a better version! Introducing Liberty Cubes! Each of these cubes has their own unique key items. These cubes can be obtained from the Item Mall. 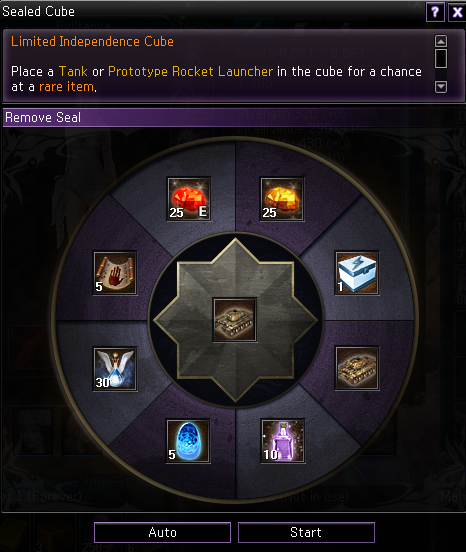 Use the Liberty Cube by right-clicking the item. Place the required mount to the cube. (Press the Auto button to automatically place the required item into the cube. After the item is placed, possible rewards will appear. By clicking the Start button, the cube will be consumed. If the roll is successful, the item placed will be consumed and will be upgraded to a better version. If the roll is unsuccessful, the item placed will NOT be consumed and you will receive a random reward. Celebrate with us and get exclusive rewards like items, mounts and most importantly MERCENARIES! See you on the surface world Atlantian and have a great day!